Why is Inventory Management crucial for e-commerce sites? Drop shipping, another term of online markets and heard by many. But do you exactly know what does it mean, how did it come into existence and how it is beneficial? Well, let’s dive into the sea to understand drop shipping. Years down the line, opening a retail store required a big amount of capital. Capital to build a store, to buy inventory to warehouse it and to market your product. Now all this set up also had a great risk involved with it, the unsold inventory can lead to high loss, the amount of money blocked in the store set up and etc. But nowadays, businesses are becoming smarter and better by moving towards online. The drop shipping is also one such supply chain management method which has helped business in being more efficient and cost effective. It allows the retailers to transfer the customer orders and shipment details to another manufacturer, retailer or wholesaler who then ships the goods directly to the customer. The best part here is the elimination of the stock of inventory by the merchant which ultimately saves a lot of costs. 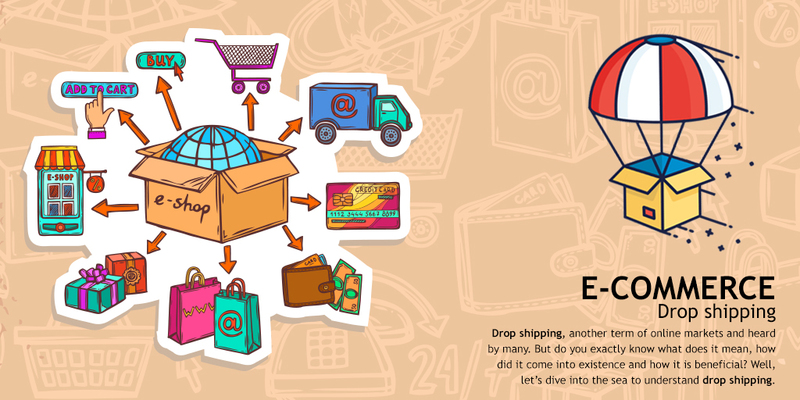 The entire cycle of drop shipping goes like this; customers place the order with phone outlet, the phone outlets forward the same to the supplier, the supplier ships the order and the phone outlets alerts the customer of shipment. Thus the drop shippers are completely unknown to the end customers. Their sole duty is to stock and ship products. Rest everything like marketing, website development etc all comes under merchants duty card. Now to adopt this process, the merchant also has to go through its challenge; finding the appropriate supplier who is ready to provide drop shipping services. The merchant can contact the manufacturer of the product which he decided to sell and ask for the list of its wholesale distributors. The merchant can also search using Google but mind it has to be an extensive search with proper modifiers and keywords. The merchant can also attend a trade show where such manufacturers and wholesalers come to exhibit or buy a supplier directory where a detailed information of such suppliers are mentioned. Thus, starting an online business with this drop shipping concept is not a big task. It just requires good marketing and searching skills on the part of a merchant. Further, the merchant gets to enjoy many advantages like, he does not need to infuse a lot of capital in maintaining the inventory, he is free from the difficult task of handling inventory and can start and run his e-commerce business much easily. Because the merchant doesn’t have to pre-purchase the items he sells, he can easily offer a wide range of products to his customers. He can calmly and smoothly scale up his business any time by just leveraging the drop shipping suppliers. With such practicality and profitability, this concept has bright potential for the e-commerce world now. In coming five to seven years, we can expect traditional retail stores to merge with the smarter online concept. Imagine you step up at the store, browse and select the items on the screen, drive back home and later you get your items drop shipped at home. This way the merchant and buyer enjoys a win-win situation where the buyer doesn’t have to pay much for the item purchased and the merchant doesn’t have to invest much in maintaining the inventory and running a huge retail show. Enterprise Application Integration: What can you leverage for Your Business?